We want to buy this in 120v for the us. Is it available? I’m looking for one in Canada. Can you let us know if you have a 120v version? Unfortunately, we have stopped doing the butter dish, at the present time. The cost to have them manufactured has escalated making it unviable to carry on at present. I am so disappointed that these butter dishes are no longer available. I have been using them for at least 10 years. I have recommended them to lots of friends. I originally purchased them direct fro Alfille innovations. Please keep me informed if and when the become available in the future. How will I spread my butter on my toast on winter mornings? Look forward to hearing that supply’s are available again soon. Thank you for your email. At present, it is not looking like we will continue with the butter dishes, but if anything changes, I will let you know! This is sad news. I really love my butter dish! I bought one for my parents as well. My 2nd one has stopped working but I still keep butter in it. Wish I could order a new one! Thank you for your email. If anything changes this end regarding the butter dish, I will let you know. Have just spent around two hours looking for outlets who sell your butter dish. I bought one a long time ago and I loved it. I still use it to keep my butter in out of habit. Sorry to hear it is not being produced now, I don’t think there is anything like it from my searches. I can’t remember the year I bought it but it was from Debenhams in Belfast. If anything ever changes and I am still around, I will be one of your first customers. Hi – thank you for your email. If we start producing the butter dishes again, I will let you know. Thank you, will certainly let you know if we are able to continue with the butter dish. May I ask, how much were you selling them for? Paul, New Zealand. Hi Paul – please contact the distributor in New Zealand for their prices. I love my one. There are so many people who want to buy one so even if they have to pay more they will buy. Please bring them back. Hi Jeannette – Thank you for your message, will let you know if anything changes. I purchased the cow patterned butter dish for my wife, she had been looking for a more traditional dish that she would like for ages. To be honest I never knew such a butter dish as the Alfille existed until just by chance it came through as a newspaper article when doing a search. She is so pleased with the way it looks, and even more pleased with how it works. Brilliant product. We are delighted to hear that you and your wife are pleased with the butter dish. Thank you for your comment, very glad to hear you are pleased with your butter dish. Do you still have these butter dishes available please? I have only just found out about them and my mother is desperate to have one and I could be tempted too! Thank you for your email. We have stopped doing the butter dishes for the present time due to the increase in manufacturing costs, making the dish unviable. If anything changes, we will let you know. Thank you for your comment. The cost to have the butter dishes made has increased significantly to make it unviable. If anything changes, we will be in contact and let you know. I PURCHASED ONE OF THESE BUTTER DISHES A FEW MONTHS AGO AND IT LOOKS LIKE I GOT IT JUST IN TIME. IT’S WONDERFUL! I HOPE THAT THEY CAN BE PRODUCED AGAIN IN THE FUTURE. I ALSO WONDERED WHY THEY WERE NOT MORE ADVERTISED BECAUSE I’M SURE THAT IT WOULD HAVE BEEN A GOOD SELLER. Dear Marion – thank you for your email. Manufacturing costs have risen to make the dish unviable at present. We hope to produce again in the future, I will let you know if this happens. Hi, I see the dishes are all out of stock, do you know when new stock will be available? Hi Mick – thank you for your enquiry. At present, we are not reordering the butter dish as the price has escalated making it unviable. If anything changes, I will let you know. Apologies for the inconvenience and thank you for your interest. I’d buy one too. I was just looking for it as summer is on it’s way. We out of stock and at present, we are not looking to replace due to price hike in raw materials. If anything changes, we will let you know. I am in New Zealand and as our fridges no longer come with inbuilt butter conditioners, and my old old fridge has finally given up the ghost ( i only kept it and put up with the leaking because the butter conditioner worked) I am desperately looking for a conditioner to keep the butter warm in our South Island Winter Climate. When will the items be back in stock? For those in NZ, Arctic Innovations trade as liny263 on Trade Me. Great butter dish BTW! Real shame they’re not available in the UK as I was about to buy one for my father. We purchased one of the butter dishes shortly after moving house to one which gas an oil AGA in the kitchen. The kitchen is thus always nice and warm so that the butter is always almost liquid. The dish solved the problem – at least it did until a few weeks ago when the fan periodically stops working and we wake to melted butter in the morning. We like to buy a new one, especially as the both the fan and the heat sink have apparently been improved. I don’t suppose our old one can be repaired, and new ones are unavailable. Disappointing as we thought we’d got this problem cracked. Could you kindly give me an address or if you have it, an invoice number so I can find you on our system. Please email me back on: info@alfille.co.uk. Butter very soft even on a low/cold temperature setting? After a period of time dust may build up around the heatsink which is situated internally under the fan area. As the fan is continually drawing in air, it is also bringing in dust particles. This could affect the thermostatic effectiveness and the dish may warm up enough to make the butter very soft even at the coolest setting. To simply remedy this, switch off and unplug the main unit. On either side of the unit are two vents. By blowing down the vents you will notice dust will blow out of the fan area, do this a couple of times and then we suggest using a vacuum with the brush attachment to gently brush over the fan area. This procedure should be carried out at least every 3 months to ensure optimum performance, reduce power consumption and prevent the unit being overworked. Is the green light on the unit, illuminated all the time or flashing? I keep checking back here periodically to see if, by some miracle, these were back in production. Alas, I’m not having any luck! I have two of these butter dishes; one I’m using (and trying to repair) and one still in the box. Is there any way we’d be able to purchase a new fan? That seems to be the only issue with the one that’s overheating. If I can’t purchase from you, can you point me in the direction of a supplier? Thank you for your message. I cannot locate you on our records, could you kindly come back to me on info@alfille.co.uk with an address, or if you have it, an invoice number and we will go from there. I purchase my 2 two Butter Wizards from a gift shop in San Angelo, Texas. I’ve kept the one with the bad motor, in hopes of finding someone who can repair it and now the other one is starting to have problems with the 2 small pins on the bottom of the unit. One is loose and not making proper contact with the base. I really wish someone would pick up the patent and find a manufacturer who could bring this back into production! I have at least 4 ready customers just in my family!! The butter dishes you have are the first designs we started with about 12 years ago. We have changed the design over the years so they do not sit on a recharging base, no batteries, they plug straight into mains power. There is a temperature control dial on the bottom of the unit and updated fans and circuit board. Unfortunately, we do not carry any spares for that version, as the pins can be pulled out and replaced. We are not producing the dishes at the moment due to the escalation in cost for raw materials and manufacturing, but if anything changes, I will let you know. We came across one of these butter dishes when visiting our son in France. Brilliant idea!! When are they going back into production? I am sure they will sell well, judging by other comments, especially with advertising – we knew nothing about them until we saw one, and other people and even Kitchen Shops thought they were a great idea. Thank you for your contact. We have been selling the butter dish for about 12 years, we were in John Lewis, Debenhams, Lakeland and then selling through our website and Amazon. Costs of manufacture have increased enough to make it unviable at present. Hopefully we will continue again at some stage. I will let you know if we do. Thank you for contacting us. We will keep a note of your details and let you know if we continue with the butter dish at a later stage. Hi, I have two of your amazing butter dishes.My sister lives in Spain and is always complaining about the butter , it is either completely runny or if it is in the fridge like a rock.I gave her one of mine and she is amazed by it and so are all her many ex pat friends,a couple of them run restaurants and they said why are you not making them anymore? You could sell them all over the continent!! I cannot understand why you have not changed your manufacturers. Sell me a hundred when they are up and running and I guarantee you they would all be sold on line within a couple of weeks. I hope you reply . Thank you for your email.The cost of raw materials for the butter dish has increased dramatically which made it unviable to carry on. We are looking at alternatives, and will let you know if anything changes. I replied through your email address. Hi, I’m hoping you can give me a bit of advice. I’ve had my dish for 2 or 3 years now and love it. But it seems to have a problem. The fan has stopped and green light is flashing and the power lead plug seems to be making a beeping noise. I have just ordered a new power lead, will this cure the problem or is it something else? situated internally under the fan area. gently brush over the fan area. Butter Dish and invalidate the warranty. unplug the butter dish, do not use and contact Alfille Innovations Ltd.
MY butter dish is several years old, and is treated as a valued member of the famly, But sadly, that member has died. Can I buy I replacement ? Unfortunately we are no longer manufacturing or selling the butter dish. Please let me know also. I wanted one for a gift. Hi Dee – will let you know if the butter dishes come back on the market. I opened mine up and cleaned the fan – works again fine! Hi Johnnie, very glad to hear your dish is working ok now. …if you own the IP why not sell that? Apologies for not getting back to you before now. If anything changes in any direction, I will let you know. I have the butter dish bought from you and the unit heats but the butter remains hard can you tell me what can be done to remedy this. My email is bettytaylor098@aol.com. My address is Hammer House Farm Smithy Lane Norton Bridge stone ST15 0NS if you need to look up the records, my name is Betty taylor. Hi Betty – I have replied to your email directly to your email address. Hi – I have emailed you directly. The rechargeable batteries are NiMH 2300 mAh Battery 1.2 Volt. I have one of your butter dishes and love it. Several friends want one, and I understand you don’t make them anymore. I’m curious though. If you have the time can you let us know how and why costs rose? And to what extent? I’m sure some would pay more for the dish. Is it an issue in China? Dear Christophe – Thank you for your message. We have the units made in China and recently labour cost have gone up by 15% and raw materials rose significantly by 30% and still continue to rise. It is making the dish unviable at present without putting the cost up respectively. We have a very loyal band of customers who have said they would be prepared to pay more, but we have to look at the overall position of what people are prepared to pay and judge it accordingly. For the time being we have stopped manufacturing but we are still hopeful that at some stage we will continue. Hi Carol – if anything changes, I will let you know. Please please satert selling this product again. It’s brilliant. Please start making electric butter again we have one we live in Spain would not survive without it . We would buy at least 2/4 a year to raffle at our charity events . Many thanks for a great product. Thanks Lloyd, if anything changes we will let you know through the website. Reading the comments section I noticed you said the butter dish would work in Canada, but our plugs are very different. Should I just get a Canadian power supply with the appropriate voltage? Also, I read the section above the customer comments about new and improved changes to the dish, but then I read a lot of comments saying it was no longer available at the moment. What is the status now, as mine has stopped working and I’d like to purchase more? Mine has finally died so definitely needing a new one! Just got sent to your website only to find they are all out of stock! I NEED one here in Melbourne Australia for my wife who simply WILL NOT use margarine!!!! Can you please advise when these will likely be available again. We are in the process of testing some updated versions of the Alfille Temperature Controlled Butter Dish, and hope that in due course, we will be in a position to begin manufacturing again. We will let you know if this happens through our website. Your wife is quite right, margarine is best left on the shelf! Wish you good luck designing! I’m looking forward to see it as soon as possible. You can sell at higher price (remember 80/20 rule), best marked as PRO version or whatever, aimed at enthusiasts and pro people (running coffee shops, restaurants et cetera). They would accept higher price, given that’s your product is unique. Best noiseless fans like Noctua can be very quiet when undervolted. They’re more costly than cheap chinese parts, but in the multi-year timeframe, it pays itself many times over. You can further differentiate your product lineup by selling some GOLD version with best fans. If they were end user interchangeable, the better. So, if you renew manufacturing, start with the 20 percent market segment of higher priced, but very reliable, silent units for pro users. It can kickstart manufacture again. But remember to differentiate the old lineup versus the newer more expensive one. Because not everybody is like most enthusiasts here on forum. People whining about blahblahblah…not realizing how much work is behind a good quality low volume product. If you won’t be able to fullfill the rest (80%) users with cheaper units, nothing happens. It would stay only for pro users, but be available somehow. I am prepared to pay some more for the PRO version, because I know real value of electronic products. It lies in long-term reliability, giving best value – the goods with higher initial price can work for some tens of years. This has happened for example in the segment of notebook computers. 2000’s models work today, plastic crap made after 2010 works hardly two years. If you renew manufacture, reserve me a unit! And mail me when you would do so. My best wishes and thumbs up! Margarine haters unite! Never! Dear Lada – Thank so much for your post. You obviously know this industry well and it was very interesting to hear your suggestions and ideas. Interesting to read your thoughts on the PRO version and we are considering this, in the meantime we hope to start production again in 2019 and will let you know when dishes are available. Thank you in advance – my other tip (possibly moot) is about TEC coolers – I’ve dealt with them some years ago. I’ve been designing a driver for them out of stock MAXIM drivers for Peltiers. It was noisy (electrically) and as I’ve learnt later, TE coolers don’t like pulsed current. So make sure (I don’t know the circuit wiring, so I’m wildly guessing) that you filter the output of whatever inverter or step-down changer or driver so you don’t shorten the lifespan of it. Maybe it’s ok the way you have it. And also make sure it doesn’t radiate out when using pulsed inverter – analog radio is the best cheap friend when figuring out its emissions 😉 (Spectral analyzer with calibrated antenna the best). Maybe the wearout is not linear, so properly overdesigning the TEC may also prolong it’s life. Some buyers on ebay or amazon were writing lovely letters about your products, but sorely missing it because it has died. They haven’t stated whether due to fan wear or TEC wear. I’m just guessing problems that may arise when designing for long term reliability. It has plagued my design then, albeit with a few watts of power and up to 5Amps of current. I’m curious what mode is better for the TEC, whether pulsed On-Off mode over greater time or regulated continuous lower current through inverter. The latter definitely more expensive product cost-wise. What I haven’t known back then was that TECs for TE cooling are different from TEGs fo TE generation. They’re different and hopefully your vendor or supplier knows the difference. So, here’re my few rants about TECs you probably know well. I was just thinking what design precautions should the designer take to avoid shortening lifespan of this marvellous device. The tip about red LED could well be dual color led or maybe a single color led but blinking, it’s visually more eye catching. Last tip about fans – some PCs run their fans at max for a while sometimes, to get rid of dust buildup. Maybe worth a try. Thank you very much for your detailed comments. These are very interesting and David will discuss these with the factory. For information, we have tested a program that puts the fans at full speed to remove the dust but the air flow was not enough to be effective. We have now added a dust screen over the fan which seems to work well. 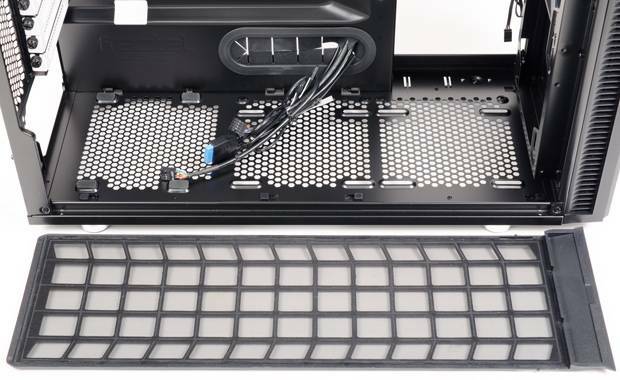 Last tip about dust screen – my PC case, Define R4 has hot-swap dust covers on the bottom of the case. They’re sliding in from the front. They’re rectangular and fit into rails on the sides. It’s very simple to clean them, because it’s not necessary to move the case. And cleaning its grid is way better when it’s possible to spray it with compressed air _from the other side_. Fixed dust covers and filters can be effectively cleaned up only with a vacuum cleaner. For removal of dust on fan blades, having access to them directly also verymuch helps – again, compressed air or vacuum cleaner nearby can wipe the dust more effectively (than through fixed dust cover). Dear Lada – A valid point the dust screen does need to be easy to remove. We are testing with dust screens now, the concern would be that if customers do not clean the screens regularly this would restrict air flow quicker than if we do not have one. We have been trying for ages to track down one of your butter conditioners with no success. It’s great to read that you are hoping to start production again soon. Do you have any idea when that might be? Fingers crossed we will be able to get hold of one soon. We may even have to plan a holiday to UK to pick it up!! Thank you for your enquiry. We are testing some updated versions, but at the moment, we don’t have an idea when we may be able to start manufacturing again. I will keep your details and let you know if we do. Thank you Annie. I just checked in again to see if there is any news about another supply of butter dishes. I hope to hear some good news soon. If the unit has had to work too hard due to the debris build-up in the worse case, it will cause the charge plug to fail as the unit has had to work so hard to maintain a good temperature. If the charge plug is not working then it will not be bringing power to the unit and not causing the fan to rotate. It sounds like it might be an issue with the charge plug and not the fan itself. The latest response to Bob maybe similar to my situation. Unfortunately I haven’t kept up with the maintenance advice and my unit no longer works. I have the flashing light, but I also thought the fan had died so purchased two of the same size and spec. These do not work so assume it is the charge unit at fault. Can these be purchased anywhere? I look forward in hope to you starting manufacture of an upgraded product and will definitely be making a purchase when available. It sounds like you may just need to purchase a new charge plug. If the unit has had to work too hard to keep a good temperature when there has been a build up of debris, then it can effect the charge plug. We have a few left in stock but they are in black. If you go to our website: http://www.alfille.co.uk and click on ‘shop’ and then ‘accessories’. Sorry I am lax at following up on this. It is nice to know that the power supplies are available because I have others in the family that do indeed need the power supply as they didn’t keep up on maintenance. NOTE TO ALL: the replacement of the fan is NOT FOR THE CASUAL HANDYMAN as it does require some amount of electronics and mechanical experience, and will likely void the UL, CSA, or other safety certifications that Alfille might have on the manufacturing (another reason it is so expensive to be a small supplier is all the government regulation). Hi Bob – thank you for your message. As you correctly said, replacing the fan within the warranty time would have made it invalid if done independently. Unfortunately, fans we have not kept in stock and I cannot point you in the right direction for a supplier who would do smaller quantities. Apologies for the inconvenience caused, if anything changes this end, I will let you know. Have one of your units and am delighted with it. Wanted to buy a second one but read are out of stock of all units. When will you start manufacturing again of your new improved version and put them on the market? Hi Adrian – No time frame at the moment, but if it changes, I will let you know. I Need One!!!! How Much Longer Do We Need To Wait? Hi Eddy – No time frame at the moment, but will let you know if anything changes. Hi Susan – thank you for your message. Will let you know any updates with the butter dishes. Please also let me know if these become available again. Hi Nisha – will do. Any news on new butter dishes being available to buy yet? Please add me to your growing list of butter lovers. I live in the interior of British Columbia Canada. My wife laughs at my description of the seasons here. We are at over 3000 feet in elevation we only have 2 seasons. SOFT Butter season, about 3 months, and HARD Butter season the other 9 months of the year. I really need your Butter keeper. Dear Dennis – thank you for your email. You definitely sound like you need a Temperature Controlled Butter Dish! I will let you know if we start manufacturing them again. Could you please email me when these are back in stock? Will do Ralph, thank you for your interest. Having read the many enquiries from like minded people as to the eventual availability,or not, of this excellent product, it would be very helpful if you could issue a definitive statement on whether they will ever be manufactured again. Whether by you or someone else. As to the escalating costs alluded to by you in one answer I and I think many others would be willing to pay a premium for such an asset in the kitchen. I had mine for nine years till it gave up the ghost,probably due to me not maintaining it properly. To paraphrase a well known TV series ” Winter is coming ” and I can’t stand margarine. Thanks for listening. Thank you for your comments. we have got a revised model we have been testing for the last few months which includes a dust cover to protect the unit from debris build-up on the heat sink. This is working well and we are getting this costed at the moment and will make a decision in the near future as to whether it is viable to start manufacture again. Hi Betty – we are not manufacturing them at the moment and we are completely out of stock. Big increase in raw material and manufacturing costs had made it unviable to carry on. But, we are testing some updated versions at the moment, and we do hope that we will be able to be in a position to carry on at some point. I will let you know. Hi Georgia – I will email you directly to find out what the issue is with your butter dish and I may be able to give some advice on line. We are out of any spare parts unfortunately. I will let you know if we start manufacturing again. I too would like to purchase one of these butter dishes, please let me know when you have some new stock. Hello Annie, I used to have an Alfille Butter Dish in my life… when I was married… but after divorce, instead of keeping the cat, he kept the butter dish! Please can you email me if and when you start manufacturing again. Regards, Kathy Gee. Hehe! Thank you Kathleen, will certainly let you know if we start manufacturing again. could you please add me to the list of people to notify when the new butter dish is available! Me too please. Do you send to New Zealand? I would love 3 butter dishes when back in stock. Hi – could you please let me know when these are available again? The heating element has packed up on the current one. Can you please add me to the list of people to inform when being manufactured again? Struggling after my 2nd one stopped working. Please let me know when back in stock, missing mine!! Hi Linsey, will let you know when we have an update. Hi Jacqui – will let you know. Could you please also let me know if/When you restock? Hi Mark – Will keep you informed when we start producing again and details of an Australian distributor. When will the butter dish be back in stock please ? Hi Linda – We don’t have a date, but we hope we will be producing the dishes again this year. Will let you know. A friend of mine owns one of your butter dishes. She raves about it! “It has changed my life” she said! So I decided to obtain one, only to discover that it is not currently in production. Imagine my disappointment. it becomes available again. Many thanks. Hi Henry – many thanks for your message, will add you to our list. Add me too the list please, I’ll buy one. Thank you. Will do Stan, many thanks. They are just the best invention ever . Can you add me to your growing list for the butter wizard please. My second one has stopped working and I am desperate to replace it. Please can I be added to the list for when you start to stock the butter dish again. In our family we would like three we are HUGE fans! My butter dish has been working properly for many years, but now, all of a sudden, the Green light is blinking and the fan is pulsating and not turning. What would cause this? Can it be easily fixed? If not, please advise me when a replacement will be available. If you find the green light on the front of the unit flashing, this could be due to the unit becoming too warm. The unit will automatically shut down and the green light will flash as a warning. Unplug the unit and leave it to cool down. We recommend that you follow the instructions on ‘Essential Maintenance’ Butter very soft even on a low/cold temperature setting. Once the unit has cooled down, plug back in and if the issue has been rectified, the dish will operate as normal and the green light will be constantly illuminated. If the problem persists then unplug the butter dish, do not use and contact Alfille Innovations Ltd. It might also be down to needing a new charge plug, as it sounds like the ampage is not enough. I performed the maintenance as suggested, but when I plug the unit back in, the flashing light immediately resumes. I think I need a new power adapter. Can you price one for me for 120V service? Hi Dennis – if you go to http://www.alfille.co.uk and click on ‘shop’ and then ‘accessories’ you will see a picture of the charge plug/power adaptor and that will take you to the ordering page. The cost is £4.00 plus postage if you are in the UK. If not in UK let me know and I will get a shipping price for you. As I stated, I believe I do need a new charge plug. I have had the butter dish off for three days and when I plug it back un, again the light blinks and the plug makes a low chirping sound. Please advise me how to order the new plug. Any idea how long it will be until I can start enjoying butter all year round please? Every year as winter approaches I have to fall back on margarine, not an ideal situation, lets be honest it doesn’t even come close to the creamy pleasure of full fat butter. And it gets me down, so very down. Only you can pull me out of the doldrums that are my life every winter. So please hurry up and make my life worth living again, yours sincerely Stan. Dear Stan – clearly we can’t have that, so I hope to give you some good news on the butter dish this year, will let you know! Oh so pleased it might come back on the market again. Why did you stop making them? I could not do without mine. Bought one for my son in Singapore and ideal there in the heat. Quite a few of his friends there want one. Please hurry up. Please, please put me on a list to notify me when the butter dishes are back in stock. I have had mine for 2 years but now have a flashing green light and melted butter. The fan has been cleaned on a regular basis (but I can never see any dust being blown out). I cannot live without butter but as our winter temperatures average 10 degrees, and our summer temperatures get up to 40 degrees, I battle with getting butter usable. I desperately want to purchase 3 more units (in case of failure) and am happy to pay any price you ask. PLEASE add me to your list. Many thanks, Sue from Canberra, Australia.